What Are Those Squiggly Eye Floaters? Do I Need to Be Concerned? Our field of vision opens up a whole new world, allowing us to experience colors, familiar faces, breathtaking landscapes, and everything in between. The gift of sight is something we often take for granted — well, until we notice that something just isn’t quite right. Have you ever experienced small, squiggly floaters in your eyes? Similar to these? These mysterious, almost dust-like floaters can appear out of nowhere — but what the heck are they? Do you need to be concerned? If you have been experiencing this phenomenon, it’s important to be aware of all potential causes. 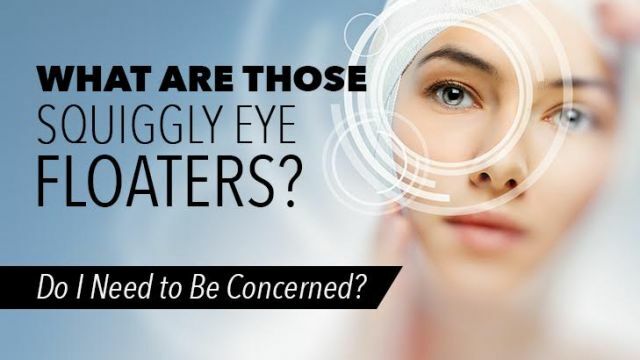 Hey, eye floaters, what are you? I’d just like to start out by saying, floaters are a normal phenomenon and boatloads of people experience them. So if you were in a panic, no need to worry — they are an indication that a natural process is occurring, as the eye changes with age. Based on optometrists’ reports, floaters aren’t uncommon. In fact, one study, published in Ophthalmic and Physiological Optics, found that each optometrist expects an average of 14 patients each month who complain of floaters. Within a separate study, out of 603 people, 74 percent reported floaters — with only one-third complaining of significant issues regarding their vision. To break it down, our eyes are filled with a jelly-like substance known as vitreous. This is what helps maintain the shape of your eyeball and since it’s clear, light easily passes through. As we age, this substance remains clear, however, it becomes more of a liquid state. As cells and fibers clump together, they cast shadows on your retina — resulting in those weird floating specks you see. Let’s take a big breath — a sigh of relief if you will — because for the most part, these floaters aren’t generally something you need to worry about. Yes, they’re generally not a cause for concern, but if you do notice dramatic changes, something serious may be the cause. Unless truly worrisome, floaters are not a reason to panic. Simply make an appointment with your optometrist so that a more thorough examination can be done, increasing overall peace of mind. With that being said, if you notice an increase in floaters, paired with a flash of light, you need to seek medical attention immediately. Well, this may be a sign of retinal detachment, something you cannot physically feel. You need to rely on these two key symptoms to warn you that something may be abnormal. Immediate surgery will be required and without it, individuals can experience long-term vision complications, including blindness. Another key cause of “floaters” is diabetes or extremely high blood pressure — due to bleeding in the eye. In some cases, an infection is to blame, as inflammation increases. Regardless of the potential cause, any major changes regarding your vision, including worsening floaters, is a reason to seek assistance. We all age — that much is certain. With that being said, you can potentially reduce eye floaters by, you guessed it, eating well and maintaining a balanced lifestyle. Our eyes may seem unrelated to our liver, kidneys and blood, but they are all connected and in order to prevent the buildup of toxic waste, proper nutrition is key. To support kidney and liver health, essentially benefiting your eyes, it’s important to consume clean, blood-building foods, such as dark leafy greens, beets and figs. In order to prevent diminishing vision, as well as a wide range of chronic diseases, the key is variety — consume a colorful diet, full of nutrient-rich whole foods. If you have been noticing eye floaters, it’s recommended that you have them examined, especially if you have noticed changes in terms of frequency and/or severity. At the end of the day, we only have two eyes, just as we have only one heart and brain — we need to take care of these essential organs and internal systems. Being proactive against eye floaters — along with your general well-being — instead of reactive, can help you maintain a higher quality of life for years to come. After all, there’s nothing more beautiful than a morning sunrise, a loved one’s smile, or a freshly bloomed garden — don’t take your vision for granted, it’s a magical part of life. Hey Buddy!, I found this information for you: "What Are Those Squiggly Eye Floaters? Do I Need to Be Concerned?". Here is the website link: https://www.thealternativedaily.com/what-are-those-squiggly-eye-floaters/. Thank you.